I have recently discovered Craftsy and started listing some of the Items that I have created there. 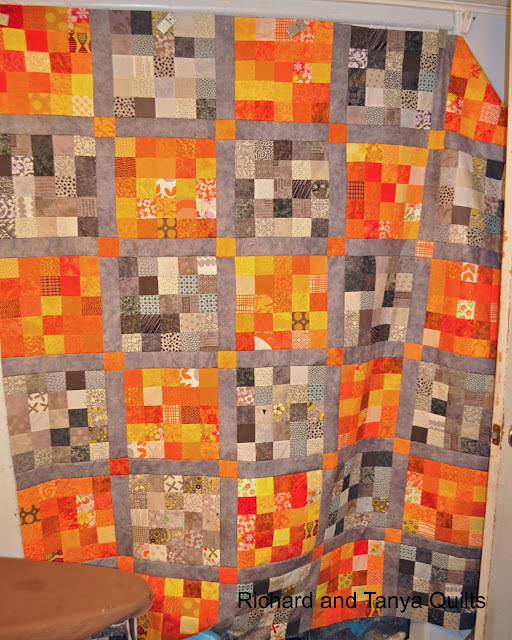 For example if you click this link or the picture you will see that I have listed my Orange and Gray quilt pattern for sell there. 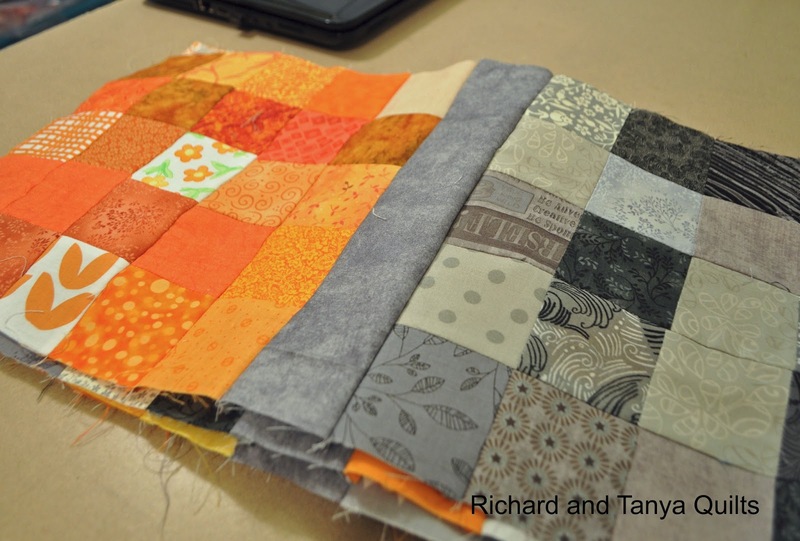 My first visit to Craftsy was to view the QuiltCon Lecture Series which is a free class you can take on Craftsy. I am a member of the Salt Lake Modern Quilt guild and the lecture series is classes that were done during the most recent QuiltCon 2013 sponsored by the Modern Quilt guild. The reason I am making this post is kind of selfish. I want to learn better ways to promote my self. And if possible make a little money to pay for my next stash purchase. After signing up for the QuiltCon Lecture Series I decided to poke around and see what all it had to offer. The first thing I noticed is that they had the ability to share patterns. So I grabbed my Richard's Star and added it as a free pattern. To my great surprise people downloaded it. You would think after the fact that people follow my blog I would stop getting surprised that some one might want my patterns. As you can guess I added the sword and the shield as free patterns. And blow me away people are downloading them also. As of last night between the 3 free patterns I have had 99 pattern sales. With all the success in the free pattern sales I have added the 2 patterns that are quilt patterns for a cost. The first 2 patterns I put up I listed at 95 cents each my wife laughed at me at such a low cost but I have sold a few already and after Paypal fee's I think I have made $3.06 I think I can afford a new fat quarter or 2 if on sell. 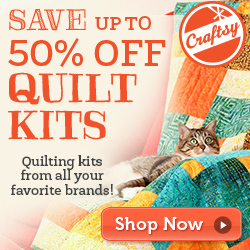 Have any of you been to Craftsy? 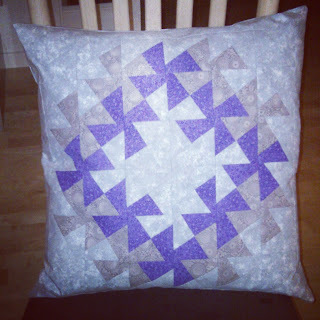 Have you listed your patterns or shared your projects there? Are you having any success? If you have never been their follow one of my links and go like my patterns or follow me on Craftsy. If you have been to Craftsy or are a regular their let me know what you feel about it are you successful at sharing your your projects there? This Car Quilt was started months ago, but just finished this week. Richard handed both of the older kids the camera to take pictures of quilts. The top one Rebecca took, she thought that a baby quilt with pictures of cars should be taken on Julia's little red car (OK, technically Jared's, but he has long since outgrown it). Next up is one from James with his usual straight down shot. We also have a folded close up from one of them. Also a few spring pictures thrown in for good measure. 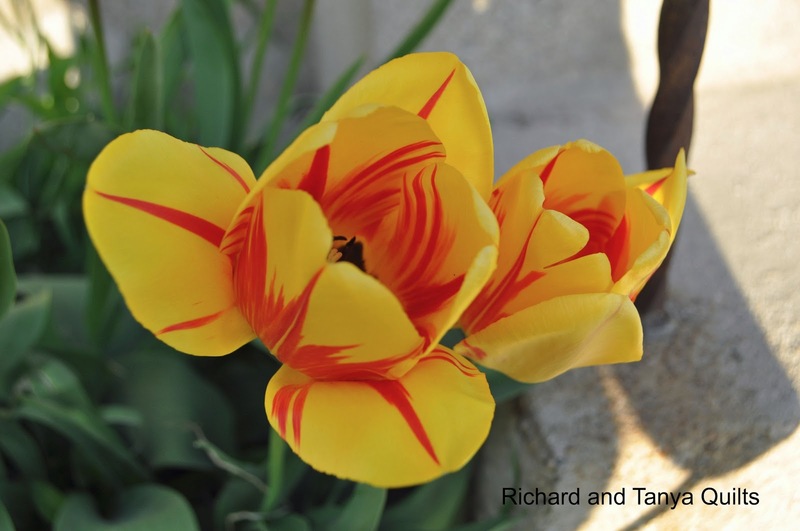 Notice the bottom red tulip, how it mixed with the yellow tulips and has one yellow petal. I thought it was quite interesting. It is a lot like our family, not quite fitting the traditional mold. (A little messed up, but still pretty) Not sure if I am referring to the tulip or my family, neither am I.
Orange and The gray are here at last. 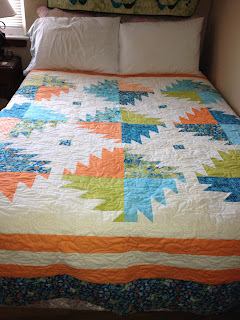 Back in January I decided I wanted to make a scrappy orange and gray quilt for my bed. I started gathering oranges and grays and started chopping them up and making blocks. The plan was to make a queen size quilt for our bed. You know by know, that Tanya HATES orange and has since vetoed the quilt for the bed. So still a year and a half after starting to quilt I still have slim hopes for a quilt for my own bed. Not to worry I will not let my orange and gray go away so fast. I made a lap quilt for myself a long time ago. Sadly it is not what I want and I don't love it (can you not love a quilt you made? Hum). Any way I have wanted a quilt that I love and I can love this one. I decided since I cant go queen it will be a large lap quilt. I decided to do 5 columns and 6 rows the blocks are 10 inches and 2 inch borders (finished size) so roughly 58 x 70 is the size of my quilt. I started sewing last night when I got home from watching a movie at 10 pm (yes I started to quilt at bed time) and I kept sewing tell it was finished. By the time my post was written (yesterdays post) for Saturday it was getting close to 2 am. Hum does that mean I still have to get up at 8 am for Jared's swim lessons in the morning? Any way not that my design wall/closet has enough room to hang it out it does look pretty. Or as my wife would say pretty (ugly) hey I can hear you talking! 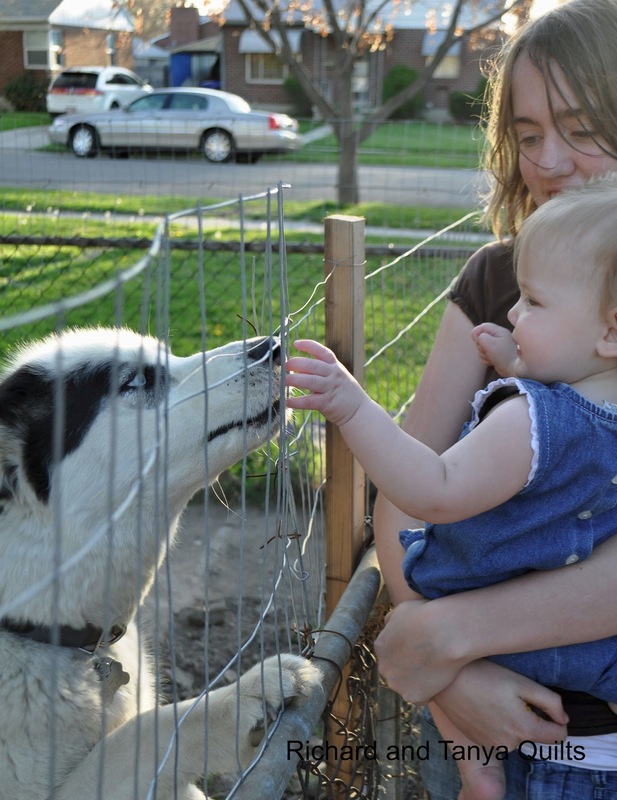 For those curious, Julia continues to grow and get cute. She is every day cutting in to my quilting time. No that is not a complaint, I love so much spending time with her. Can we say Zoo Trip Planned? As you can see in my last picture she loves the dog next door, even if its bigger than her. Oh time flies when you are having fun. Today's Finish is Tanya's newest quilt. 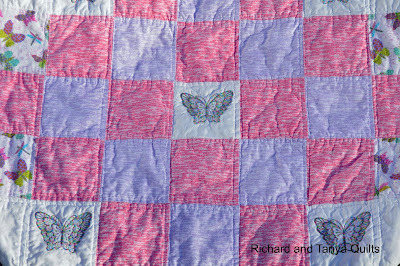 The 9 butterflies on the white background was created using her Brother Embroidery Machine. It is a entry level machine, almost the cheapest we could find but it creates some cute designs. The butterflies came on the machine, we have yet to figure out how to get more designs. 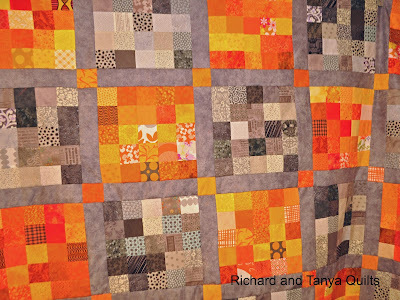 Tanya created the pattern for this quilt. You can see below that it alternates the pink and purple blocks as it explodes outwards. 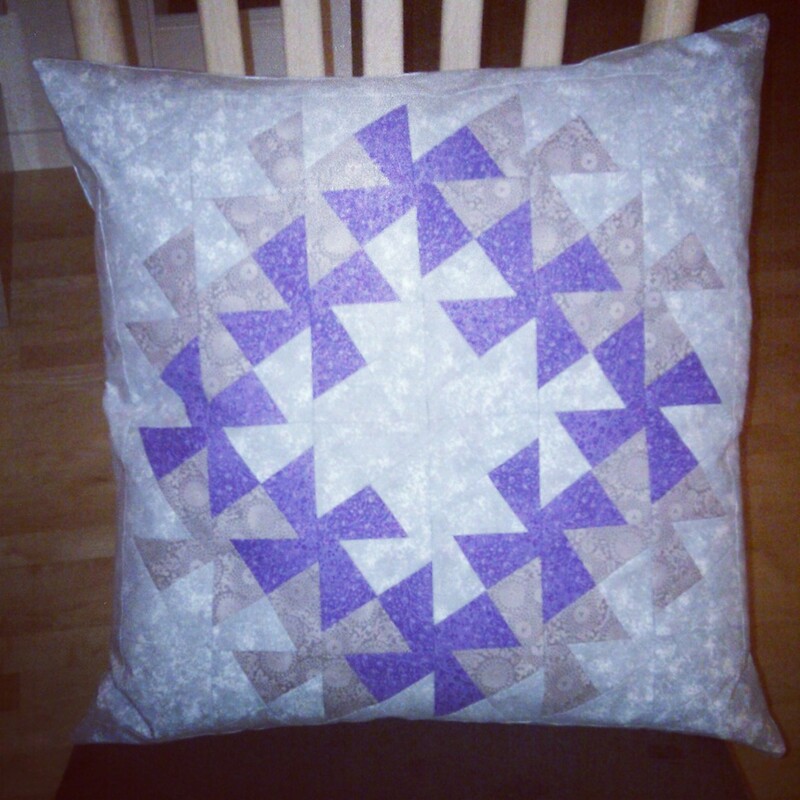 Tanya echo quilted this on both sides of the seams. Our son James took the pictures for today's as you can see the only closeup shots are the center of the quilt. We were not hiding any thing by not showing any where else (except in the full quilt shot), but he seems to like to center things). While Tanya embroidered these butterfly's me and the kids were just amazed watching the machine spit them out. In a previous post I talked about the only fatality was one butterfly lost its life while the machine was clunking away at it the thread got stuck and the machine did not stop and it ripped a hole in the material and broke a needle. It is amazing how fast it can go from great to disaster. One thing I always love when my son takes the camera to take pictures is the pretty things that he finds and shoots along the way. This is one of my wife's flower in the front yard. 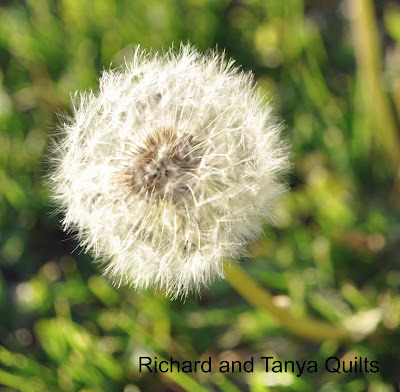 The dandelion is one of Julia's favorite flowers to pick. 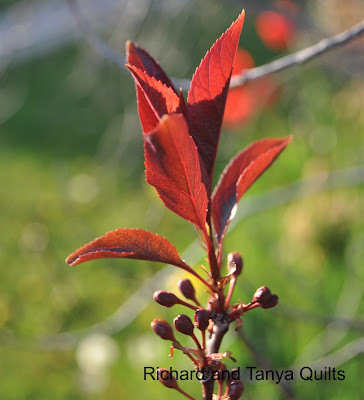 Last we have one of the leaves on one of our bushes in the front yard. It is cool how something up close can be so interesting. It is now time for Link A Finish Friday. Today I would like to start with a big thank you to Fat Quarter Shop who has offered to Sponsor our Link A Finish Friday with Prizes. This month's winner (April) will win a $15 gift certificate to spend at Fat Quarter Shop. My wife tells me I have been slacking this last week, as I have not had a post since last Link A Finish Friday. I have been working and will on Saturday and Sunday have 2 new quilts to show off. 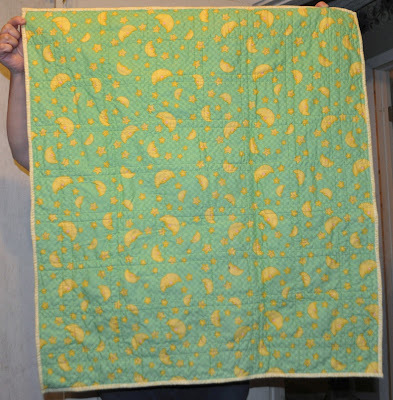 I am super proud of Tanya, this week as she quilted her second baby quilt. 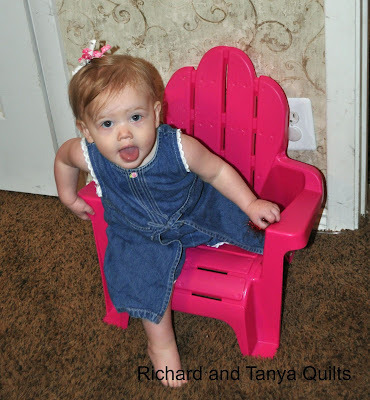 I have more then a few quilting jobs under my belt, but she is still struggling to find her quilting legs. It is only out of desperation though that she quilted, I have been really busy at work this last week and the 2 quilts that I finished tonight (binding) are in the wash and will be auctioned away for girls camp at our Young Women's Auction this Saturday night. 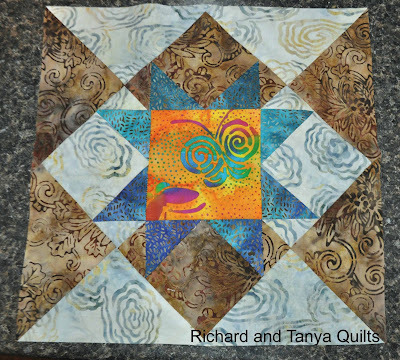 Below is another sneak peak of Tanya's Quilt, more to show off Saturday. In more interesting news here are some of the quilts linked up last week. Thank you to all that come and share with us. I love the world we live in today. I can Follow and learn from bloggers from all over the world. With my Trusty friend Google Translate I can even read what they say. Are some of the great quilts linked up last week. Thanks for all of the great linkups. Hexies at Where's My Seam Ripper? Over the last few weeks I have talked about and shared some about this and its green twin. This is the first to be completed. 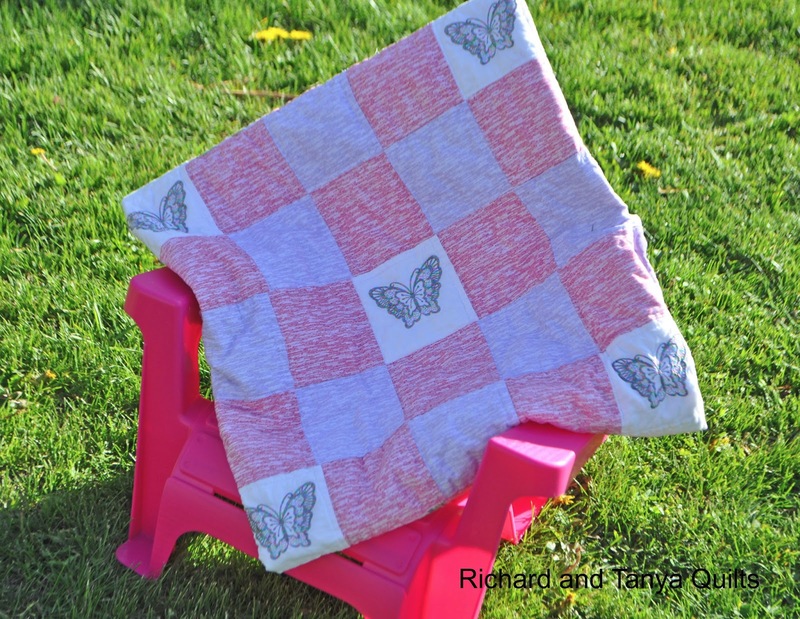 This quilt was created as our supply of boy quilts is out. 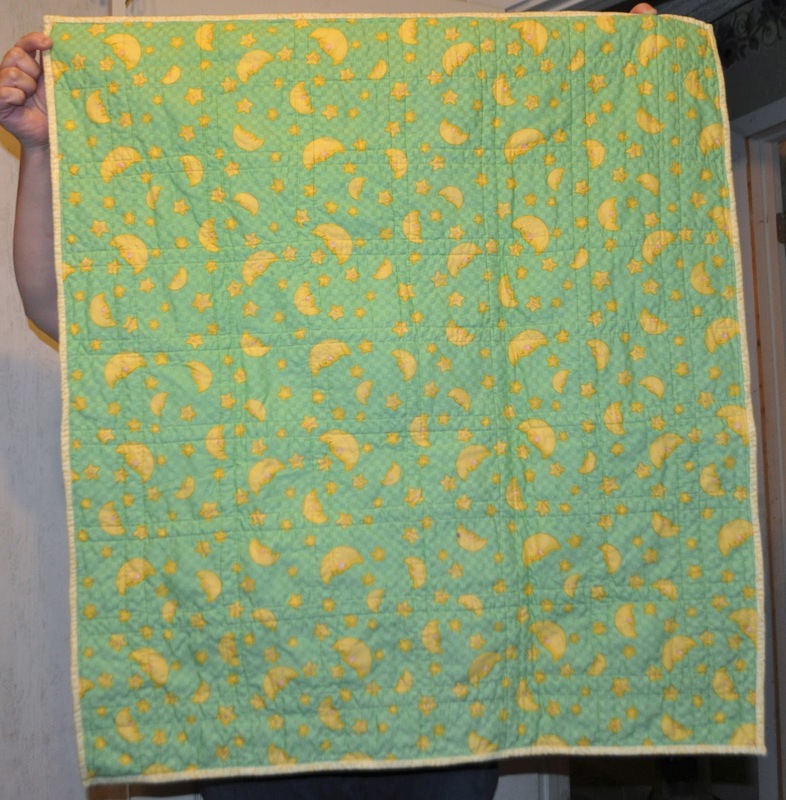 Most of our friends that have had baby's recently have been all boys and we have none on our Etsy store so this quilt and the green one was made to up the stock there. 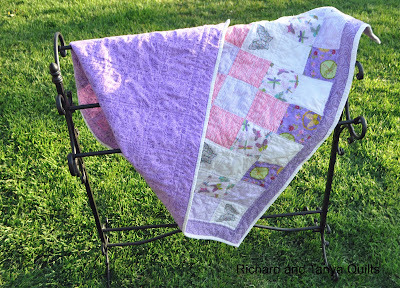 If you are desiring to have this quilt you can buy it there. Yesterday I shared our Moon and Star quilt. When Tanya made that quilt top, I loved the simple thin green border, and the outer border. So I changed the original design that I was going to do for this quilt (which is why I ended up with 2 quilts) and I did one green and one brown quilt following that pattern. 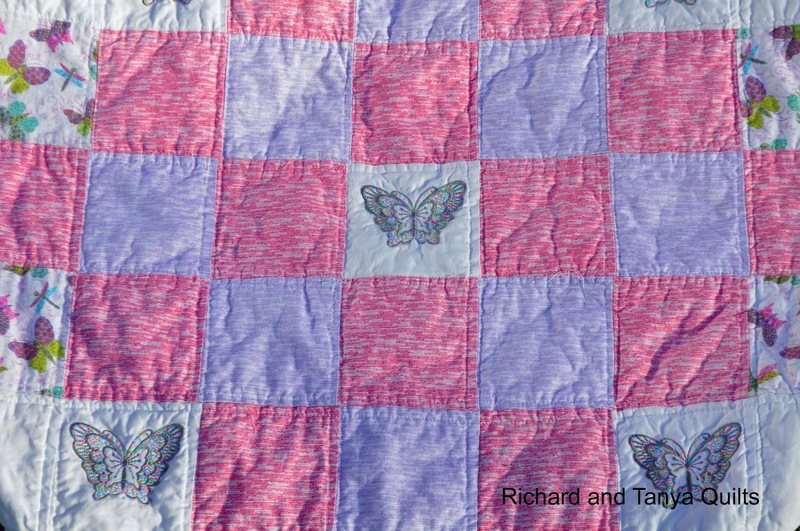 Today we would like to share a simple baby quilt that was created by Tanya and quilted by Richard. It was created specifically for putting it on sell in our Etsy Store. 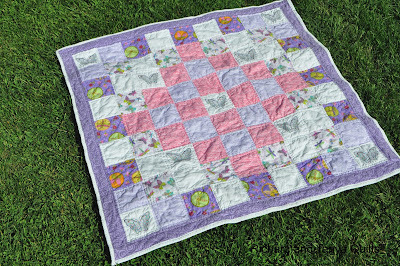 We have found that some of the simpler quilts we have made sell faster then the more complex quilts especially for babies. This quilt like most of my more simple quilts has been straight line quilted using echo quilting. 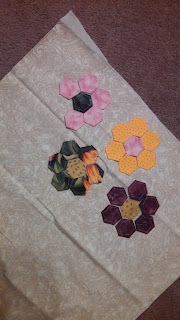 Here is a a picture of the quilts that I basted, most of them over the weekend. 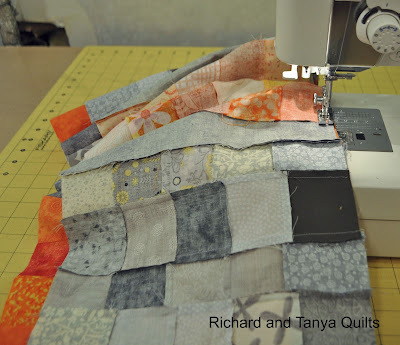 If you aren't a regular, this post is brought to you by Tanya, Richard hates basting quilts (pin or spray). I did give in and went and bought some more pins. I don't think Richard will run out of quilts to quilt anytime soon. In Richard's defense, he did get one quilted and bound. It is in the wash and pictures will be coming soon. I also finished two quilt tops this weekend. The owl will most likely go on Etsy and and the butterfly one is for girls camp auction. The owl is a star quilt as Richard pointed out. I was going for alternating blocks from 8 1/2 inch squares forming half square triangles . 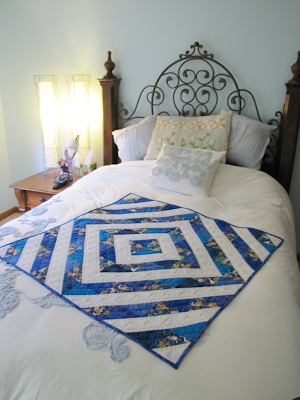 This was using the same pattern that I did the pieced rag quilt in. I don't know if I will ever do that large of blocks again in a pieced quilt. I think 5 or 6 inch squares are easier to work with. The Butterfly quilt top is in the pile of stuff to be quilted. 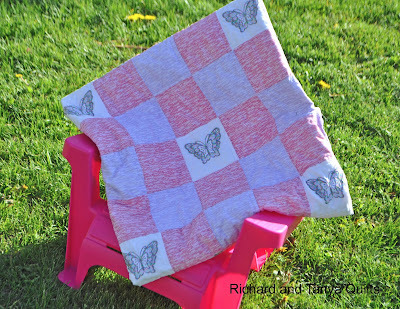 I plan on doing another Butterfly one in different colors, it was fun and simple quilt. The other boring stuff I did over the weekend involved hand sewing the sleeve on a quilt Richard is displaying at HMQS for part of Salt Lake Modern Quilt Guild Display. We watched a movie while setting on the couch and hand stitching. Richard should be proud, I didn't even fall asleep. Normally I fall asleep while watching any movie at home. Last night I was trying to get Julia to go get one of her toys. She said toy and went and grabbed a strip of fabric. I thought it was cute. I finished the green owl quilt top last weekend and Tanya was kind enough to baste it for me. It is sitting in a pile, that is growing every day, of quilts that need to be quilted. Tanya pointed out to me this morning that she is out of pins and I must start quilting some of these. The current pile has in it the above Green Owl Quilt, it has the Brown Owl Quilt, A baby Pieces of hope quilt. Tanya has 2 other baby quilts one is one of the Jelly Roll quilts (the back to the second one we ordered did not match as well as we hoped and its now back in the needs back pile). 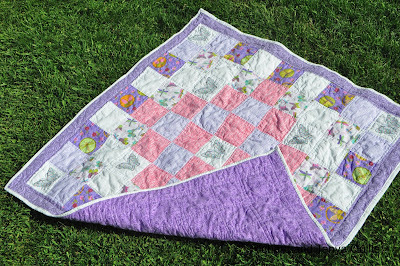 She also has the baby quilt that was made from the left over pieces of Rebecca's Quilt half basted and waiting for pins! Now personally I think we need to buy more pins and not rush me, but Tanya says I am slacking and need to get those quilts done. Tanya has been playing with her most recent quilt. You can tell she has a style different from me, which is great as who wants to be like some one else. She made 9 of these butterfly's using her embroidery machine this is the first "Big" project using it so far. These 9 will be put as blocks in a quilt she is making. Last I saw there were 4 rows of this quilt sewn together, but I will not share it and wait for her to show it off when done. It does amaze me how fast and neat that the machine cranked these out. And to think only 1 butterfly was damaged in the making of this quilt. You ask how can you hurt a butterfly? The thread got stuck on the bobbin and with the machine going full blast, before we could get to it and stop, a needle broke and the butterfly died. It was a sad loss it sat on my desk for a few days, before I had the heart to put it down. A lot going on in the background!